In July 1863, Confederate Brigadier-General John Hunt Morgan led the deepest incursion into Union territory during the Civil War. Just two days before Morgan was captured, his (then 400) raiders followed a route through the southern tier of Harrison County, passing within five miles of Stratton House. Morgan and his men entered Harrison County near Smyrna (see upper-left corner of map) and traveled through Moorefield, skirting to the north of New Athens. On the night of 23 July, Morgan made camp in the Tom Worley sugar grove and the W.W. Dickerson farm west of Georgetown. (See: Detailed Map - Zoom in for a more detailed map. Then pan east to see Harrisville. Pan southwest to see Flushing, Ohio, where Stratton House is located). After breaking camp from the Worley farm at 4 a.m. on 24 July, Morgan continued on the valley road toward Georgetown; but advance scouts discovered a battle line of 1,000 Harrison County militia dug-in ahead of them. As a result, the raiders turned south toward Hammonds Crossings (Crossroads) where they came upon Union troops led by General Shackelford, and were fired upon. Two raiders were wounded. Again Morgan turned east, ascending to the ridge road to Harrisville, Ohio. Shackelford did not pursue Morgan immediately, because his men and horses were exhausted. Meanwhile, the Harrison County militia had relocated to the hills overlooking the road, and at some distance, fired on Morgan's soldiers. 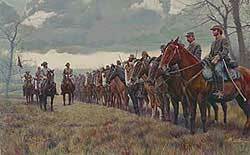 Shackelford also ordered his artilery to open fire upon Morgan's retreating forces. 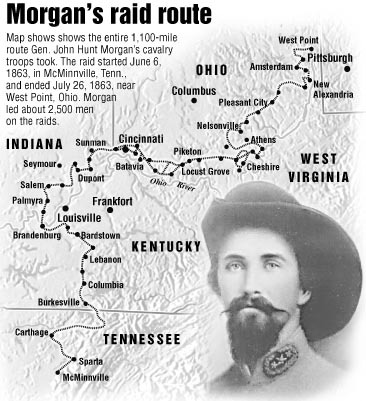 Morgan's rebels entered a virtually deserted Harrisville, Ohio, around 6 a.m. where they took 30 horses and any food they could find. 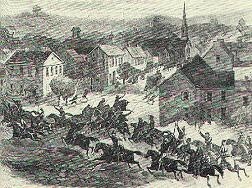 Morgan did not linger long, and shortly after his raiders left Harrisville, Shackelford and his soldiers entered the village. Here Shackelford again stayed for several hours, giving Morgan time to escape toward Dillonvale [in Jefferson County], and beyond. But escape was temporary. On 26 July, Morgan and his men were captured at West Point in Columbiana County. Captions: Top Print of Morgan's raiders, by Mort Kunstler. It is offered for sale by King James Galleries. Middle Two images depicting Morgan's Raiders. The first is a Union propaganda image showing Morgan's raiders sacking a northern town. The second is a sketch of the raiders in an Ohio town. Both are courtesy of Reenacting with Ferguson's Independent Co. - John Hunt Morgan's Cavalry, CSA (Reactivated) Bottom: Monument marking the site of Morgan's capture at West Point, Ohio. Guernsey County's Reenactment of Morgan's Raid through that county. From Guernsey County, Mornan's men entered Harrison County (see history above).